Commercial kitchen exhausts may create problems with smoke and odours, especially in urban neighbourhoods where residential housing exists adjacent to or even above the commercial establishment. These might be pubs, takeaways, or catering services as well as dining restaurants. For this reason it is important that an adequate ventilation and filtration system be in place. 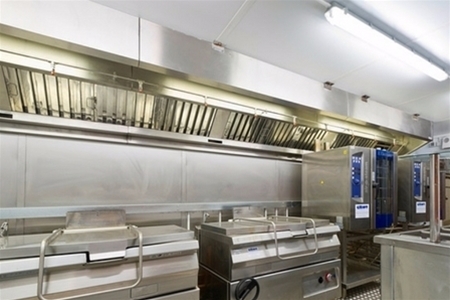 The two main types of ventilation system are kitchen canopies and ceiling ventilation, often used together to ensure maximum airflow across multiple cooking stations. The venting itself is usually low pressure ductwork, and the recommended material for maintaining hygiene is stainless steel. Ventilation rates adequate to the volume and ambient temperature of the space. Fans adequate to maintaining air flow and duct pressures. Make up air system to compensate for approximately 85% of evacuated air. Air filtration system for removing airborne contaminants and odours. Often the source of odour is from chemicals that exist in particles too fine to be captured in ordinary air filters or which exist as a gas. In mid-to-high demand commercial kitchens treating this component of exhaust takes the form of adsorption methods which remove contaminants chemically or through electrostatic means, often as a secondary stage of an air filtration system. Where local planning ordinances restrict the use of dispersal stacks more emphasis must be placed on the filtration system. A basic air filtration system should deal with more moderate odour problems, but also can provide an effective pre-treatment stage before adsorption. A filtration system generally consists of three phases to create progressively more efficient results, depending on commercial application needs. A disposable air filter made from non-woven, synthetic, fire-retardant materials that can also act as a secondary grease filter . An efficient bag filter trapping up to 95% of remaining particles. A high efficiency filter capturing up to 99% of remaining particles. This type of filter may impede air flow and lead to pressure drops. This is a process which involves capturing airborne compounds on a fine particulate-active surface. There are numerous materials used, such as Zeolyte, silicas, and resins, but activated carbon is by far the most common. These go into a filter housing and are often refillable or replaceable. They consist of activated carbon, manufactured from natural carbons such as coal, peat, or wood, and physically modified through chemical or thermal composition to give them a very large surface area per volume with sub-microscopic pores where adsorption takes place. Contaminants adhere to the carbon surface and are trapped. Carbon filters come in many varieties and should be adequate to the volume and demands of the overall air filtration system. They should be cleaned every 4-6 weeks. Also called inline oxidation systems, ozone or oxygen ions are activated via UV lamps or electrostatic field and introduced to exhaust. These ions chemically bond with and neutralise contaminants, which are then expelled. These systems tend to be less effective in high humidity and high temperatures. Filtration of grease or coarse materials can be provided by baffle filters or washable filters at the point of extract. Use of disposable filters is discouraged. These are comprised of layers of non-corrosive galvanised or stainless steel mesh screens in a steel housing. Grease particulates are deposited onto the mesh surfaces. Performance varies with use and temperature and mesh filters require regular cleaning. They should be limited to environment with low-level grease production and no risk of fire. These consist of interlocked vanes which provide two-way grease removal. The air passing through the filter undergoes a change in velocity and direction, so that the grease becomes separated from the air and is deposited on the vanes. This grease is drained off through weep holes in a collection drawer or pan that has to be periodically cleaned. The grease drawer is sized according to the type of cooking and expected cleaning intervals. It must be separated from the air flow so that re-entrainment of grease doesn't occur. Baffle filters should be installed at no less than 45 degrees from horizontal. Resistance to air flow is greater in a baffle than in a mesh filter, while the blades provide a barrier against flash fires. These filters are designed for capturing heavier grease loads. Cartridge filters are installed to form a high velocity opening to a series of baffle filters causing air to change direction four times compared to two changes in an ordinary baffle. Cartridge filters should be installed over the full length of the extract assembly and are sloped from the horizontal to allow the trapped grease to drain into the grease drawer. Because the air is forced through at a higher velocity it allows lower air pressures to be used. These comprise an extract assembly not dissimilar to cartridge filters except that there is a built in self-cleaning apparatus. The interior of the extraction system chamber is sprayed with pressurised hot water and allowed to flow through a drain. This allows for not only easy maintenance but also fire suppression in the ducts and extract plenum. The water wash canopy is operated by a control system, and in simplest circumstances is operated at the end of the cooking process each day. Fully automated systems are available. These use a spray apparatus similar to water wash systems except that a fine cold water spray runs continuously during the cooking process. Grease-laden air which enters the system is cooled by the water so that it solidifies and drops out of suspension into a grease trough which flows to a drain. These system is suited to solid-fuel kitchen appliances where any sparks or hot embers are extinguished by the spray. The Environmental Protection Act of 1990 allows the government to take legal action against commercial kitchens if they are judged to pose a nuisance through the discharge of grease, smoke, or odour. Thus it is important to plan air ventilation systems accordingly so as to minimise the effect on the public and the future of conducting business. F911020/P/430/01 430 polished 245 x 495 x 48 1.1 10" x 20"
F911616/P/430/01 430 polished 395 x 395 x 48 1.35 16" x 16"
F911620/P/430/01 430 polished 395 x 495 x 48 1.7 16" x 20"
F911818/P/430/01 430 polished 445 x 445 x 48 1.5 18" x 18"
F912016/P/430/01 430 polished 495 x 395 x 48 1.7 20" x 16"
F912020/P/430/01 430 polished 495 x 495 x 48 1.8 20" x 20"